Guardians of the Galaxy has become one of the biggest movies of 2014. As parents, we know that when a superhero movie hits it big in the theaters, our kids are going to want E-V-E-R-Y-T-H-I-N-G they can get their hands on that has to do with the particular movie. Adrian is one of those kids. He loves superheroes, begged me to see the movie and now he goes around thinking he's Star Lord! I'm not going to lie, I loved the movie myself and have probably egged on the newfound obsession with the Guardians! 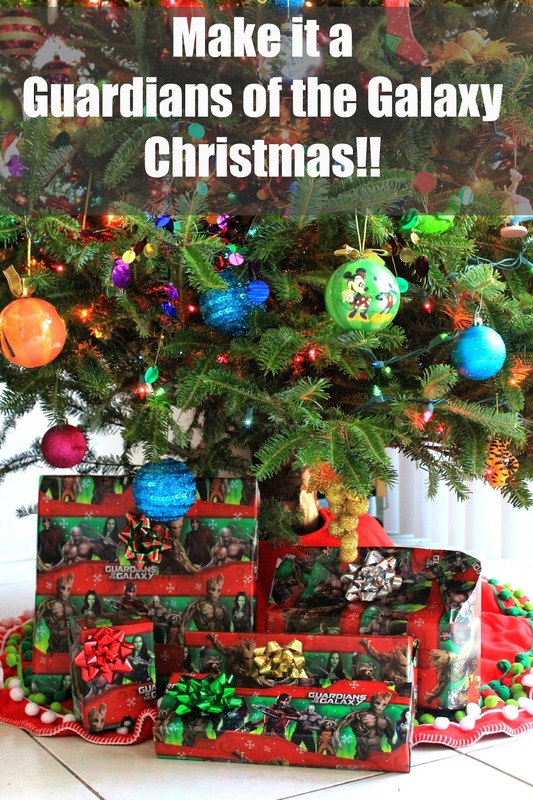 I might have even dubbed this year, the Guardians of the Galaxy Christmas! I have been scouring the stores and the internet for Guardians of the Galaxy merchandise to get for Adrian and a few other family members that are also obsessed with the movie. I have found alot of things at Walmart! 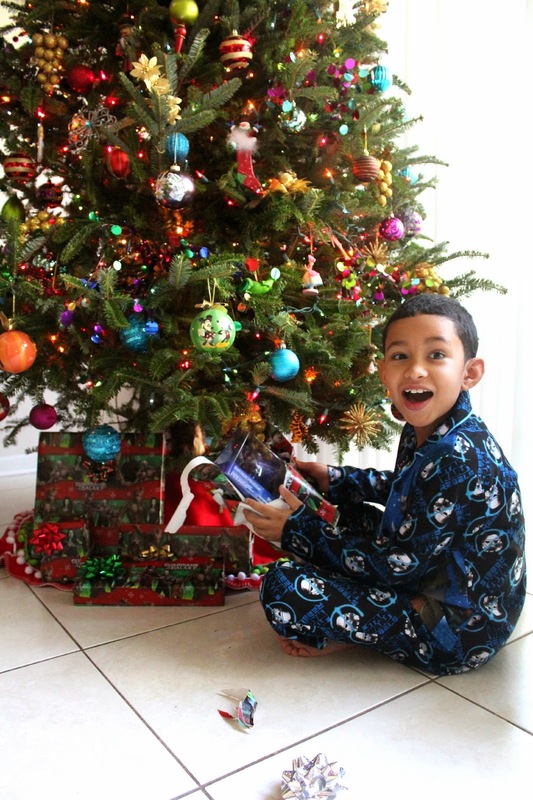 I have even put all the amazingness into a gift guide that I have sent family and friends that have been asking me what to get Adrian for Christmas! 1. Guardians of the Galaxy Body Pillow: ($9.96) You know kids need to have their favorite character bedding and this pillow is fantastic. I can imagine Adrian laying on the couch, on his pillow, watching the GOTG movie over and over!! 2. MARVEL: Guardians of the Galaxy DVD: The Blu-Ray/DVD/HD ($19.96) release date is December 9th (just in time!). This DVD inslcudes an exclusive character )-sleeve and exclusive music zinepack and a 64-page magazine with cast and crew interviews, exclusive behind the scenes photos and trivia PLUS a custom "cassette" laptop decal! This will definitely be in Adrian's stocking! 3. LEGO Superheroes Knowhere Escape Mission: ($36.97) This is on the top of Adrian's list. He is a GOTG fan and BIG LEGO fan so this set is perfect! This playset includes the Groot and Rocket Racoon minifigures so this one is definitely a must-have! 4. Guardians of the Galaxy Soundtrack ZinePack: ($14.88) If you have already seen the movie, you know just how epic the soundtrack is! A bunch of classics that I need to have in my music collection! This ZinePack includes the CD, a digital download and a cassette laptop decal!! So fun! 5. Disney Infinity 2.0 Groot and Rocket Racoon Figures: ($13.98) OK these are biggies right here. All Disney infinity players looking to grow their collection wants these characters. They play on both the GOTG playset (#6 below) and in the toy box. Oh and right now, you can get a $5 Walmart gift card when you purchase a Groot, Drax or Rocket Racoon figure so these are an amazing buy and a great gift! 6. Disney Infinity 2.0 Guardians of the Galaxy Playset: ($34.96) This is BIG right here. If you have a Disney Infinity fan in your home, then this is the playset I'm sure they have been asking you for! This playset comes with the Starlord and Gamora figures! 7. Milano Starship Vehicle: ($21.98) All GOTG fans need Starlord's amazing plane. 8. Titan Hero Series Rocket Racoon 12" Action Figure: ($7.37) No super hero collection is complete without action figures and every GOTG fan needs a Rocket action figure! I've already gotten started on Adrian's wishlist while I was at Walmart the other day. 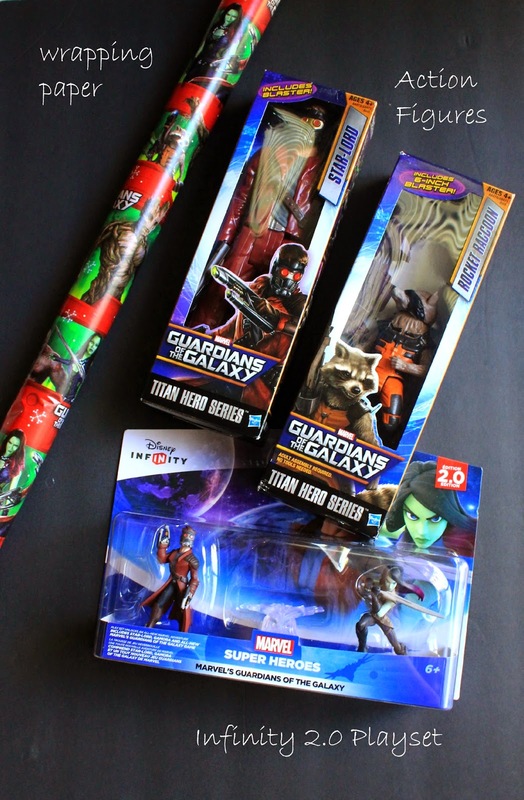 I purchased the Disney Infinity 2.0 GOTG Playset, Starlord and Rocket Racoon action figures and I found GOTG wrapping paper! The surprised look and this smile right here is it for me. 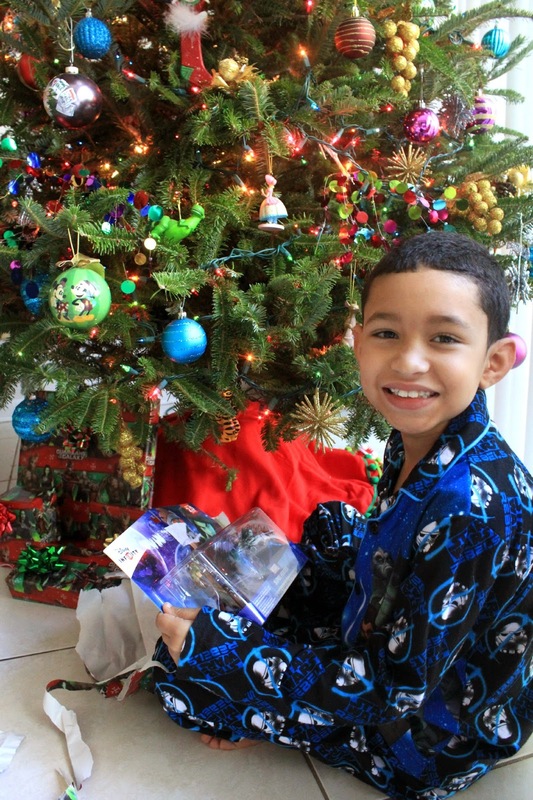 Yes he picked the Infinity playset and he has been playing it ever since, any chance he gets! 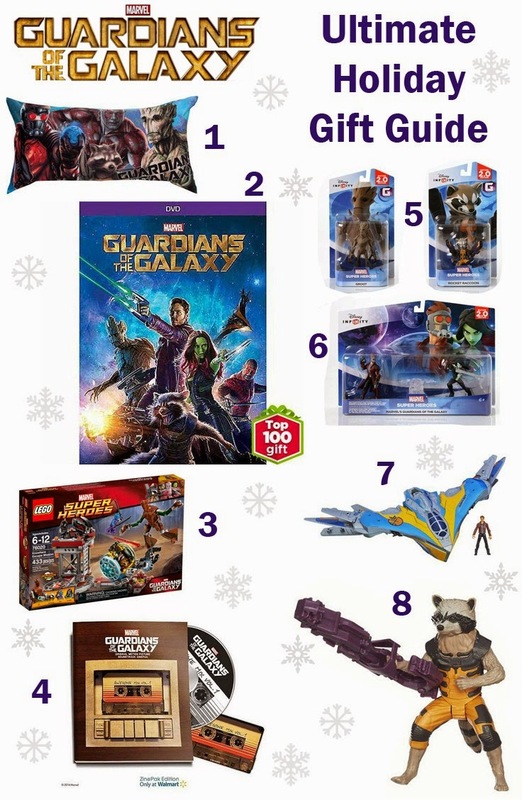 It's looking like the Groot and Rocket Racoon figures will probably be stocking stuffers, along with the DVD that I already pre-ordered! 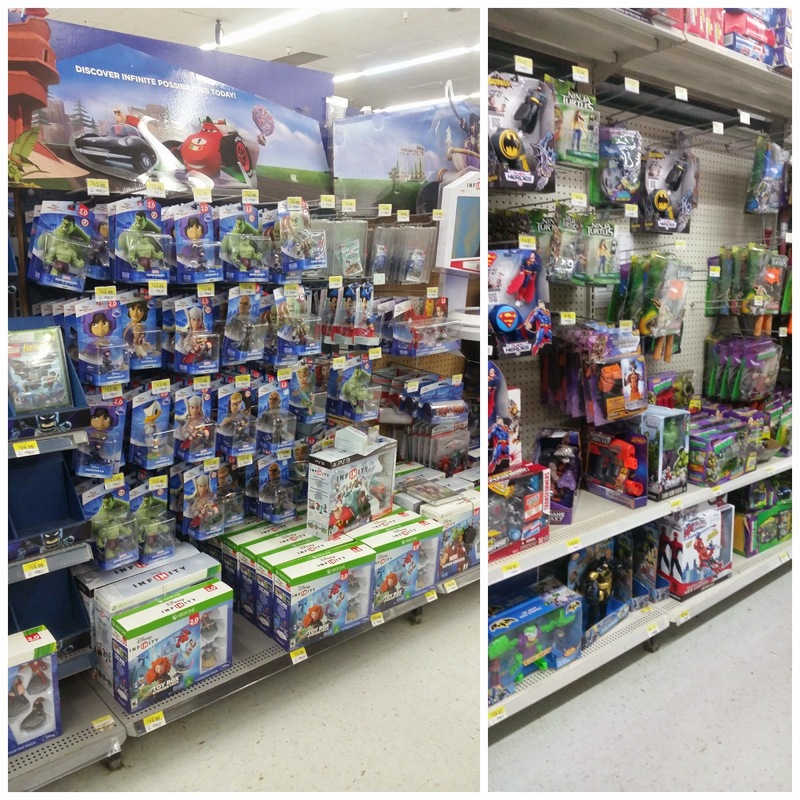 Guardians of the Galaxy merchandise is available at Walmart. I have found merchandise in the toy section, home section, entertainment section and the music section. Did you see the Guardians of the Galaxy movie in the theaters? Will the DVD be a stocking stuffer for your superfan this year? Those are all some really great ideas for Guardians of the Galaxy fans! That was a super early Christmas present! Looks like he really enjoyed though ,lol ! Love this! I can't wait to pick up this movie tomorrow. Family movie night! The wrapping paper is awesome! I absolutely loved the movie and I would want all of these! I'm' afraid I'm behind the times and don't even know what Guardians of the Galaxy is! But I'm sure fans will love those!